One of the ways that I have been able to manage my time with such a large family and still manage to have dinner on the table is to do most of my cooking in batches of freezer meals. When our son had to begin a gluten-free diet, there were changes that I had to make to my usual freezer meal recipes to accommodate his new food sensitivities. 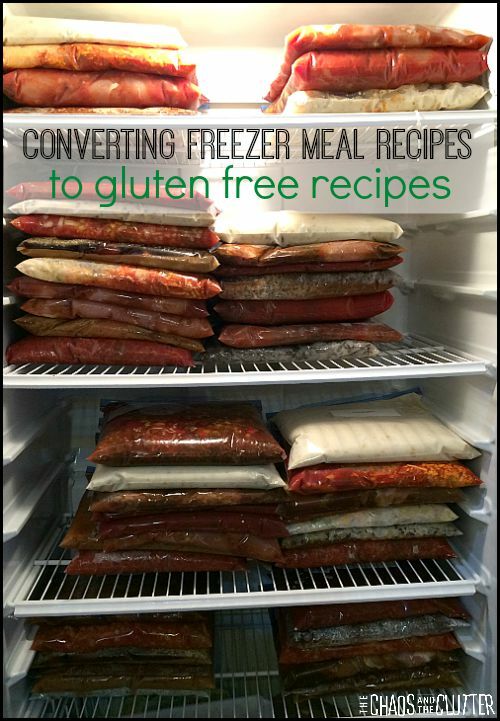 There are certain considerations to be aware of when converting a regular freezer meal recipe to a gluten free one. I’m sure there are some that I have not considered here, but these are some that I have found when making freezer meals for my family. The most critical thing to know to be able to convert regular recipes into gluten free recipes is how to read labels to find hidden gluten. Gluten can be called many things and it’s important to be able to identify it. Here is a list of ingredients to be on the lookout for if you are trying to avoid gluten. Another thing to be aware of is that the consistency of gluten free items can be very different than non-gluten free, so for certain recipes, you will have to experiment. For pasta, I prefer Tinkyada brand because it maintains its shape well and doesn’t seem to get as mushy as some other brands. The other trick I’ve found with pasta when it comes to gluten free freezer meals is to either cook it to just under what you normally would before including it in the freezer meal or to leave it uncooked and attach it to the bag and then cook it normally and add it on the day you serve the meal. When it comes to things such as tortillas, the gluten free varieties don’t always hold up well to being in a freezer meal. I have yet to find a recipe that works for gluten free burritos in the freezer. I have personally used Udi’s gluten free tortillas in some of my freezer meals and had them turn out and have also used corn tortillas. I suggest you experiment to find what works best with each recipe. 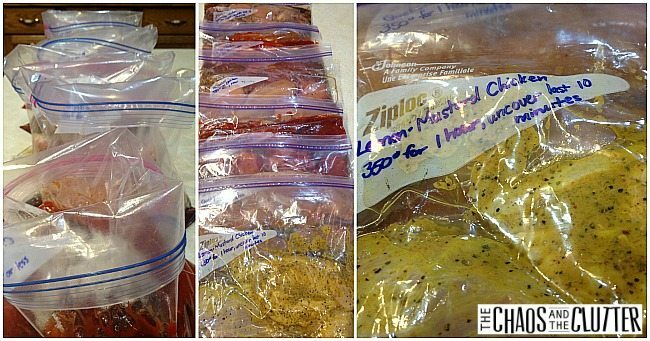 When I make freezer meals, I generally plan ahead and make one or two month’s worth of meals over one or two days. I often do it in a small group or with a friend. Just a week ago, my friend Christie and I made 110 freezer meals (55 each) over the course of two days. I have it down to a system! You first need to plan it out, then need to get everything prepared, and finally, execute it on what I call The Big Day. It’s a lot of work, but so worth it! I love not having to think about what I’m going to make for supper for the next few months! There are some ingredients that seem to be very popular in freezer meal recipes that you need to be careful of when avoiding gluten. Most of the store-bought versions of this contain gluten. There are some versions that are gluten free but you need to read the labels very carefully. At a bulk bin store near me, they carry a gluten free dry onion soup mix. Alternatively, you can also make your own using a recipe such as this one. There are condensed soups available to purchase such as Condensed Cream of Mushroom Soup from Pacific Natural or Amy’s Organic Cream of Tomato. There are also recipes readily available online for making your own cream soups such as this one for cream of mushroom soup because gluten is usually found in most condensed soups. Some of the common sauces often called for in freezer meal recipes usually contains gluten. These include soy sauce and hoisin sauce. Be careful to choose a brand of soy sauce or hoisin sauce that does not contain gluten. Many seasonings, especially seasoning blends contain gluten. A lot of my freezer meal recipes call for taco seasoning. Most taco seasonings contain gluten, but there is a tex mex seasoning blend that does not contain gluten. This can be substituted for taco seasoning without compromising flavour. Again, you can also make your own taco seasoning mix. 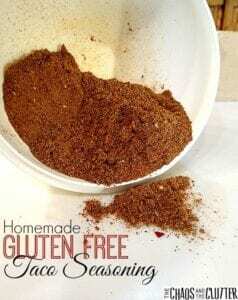 This is my recipe for homemade gluten free taco seasoning. I buy many of my seasoning blends through Epicure Selections, as they have really wonderful spice blends and mixes and they are gluten free. Many are also sodium free which is a preference of mine because then I have control over how much salt I add to the dishes. 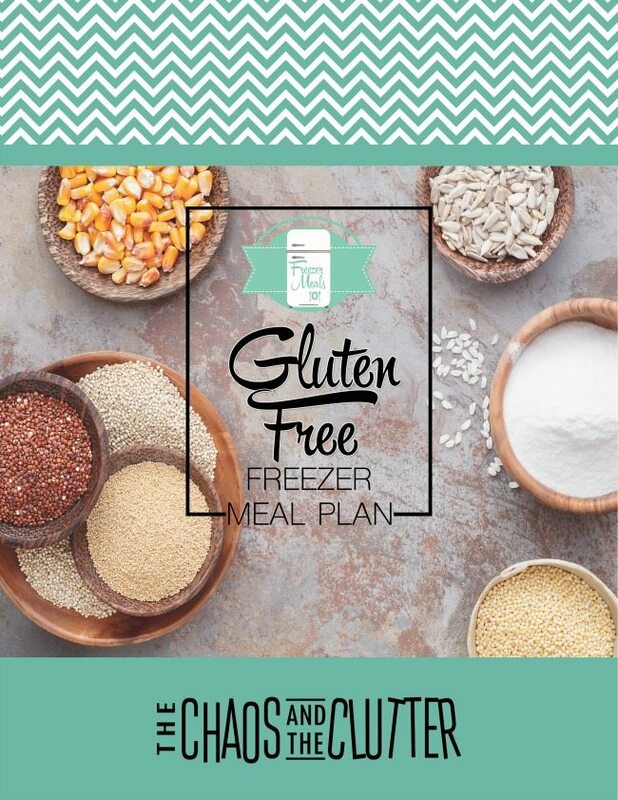 Our gluten free freezer meal plan includes 5 of our tried and true recipes, shopping lists, prep list, and printable labels. Of course, for the fastest freezer meal recipes (enabling you to assemble 10 meals in just one hour), check out my Chicken Dump and Beef Dump Recipes. All of the recipes include gluten free instructions. 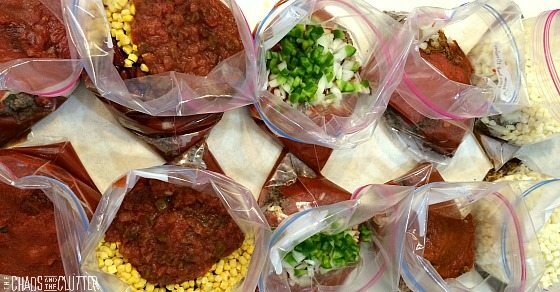 Dump recipes are the easiest and fastest way to stock your freezer full of meals. I’ve been making them for about a decade and though the name may not sound that appealing, it speaks to how fast these really are to make. 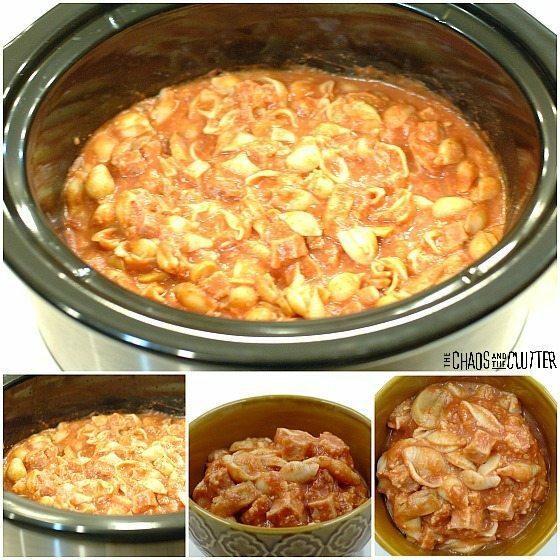 Most of my dump recipes can be cooked in the crock pot, saving even more time. When I wrote about my Chicken Dump Recipes, the response from busy women (and men) everywhere was overwhelming! They loved the ease of the system, but the resounding feedback was: more recipes! I have been working since then to create a book of Beef Dump Recipes for you. It contains 6 meal plans of 5 recipes each which include shopping lists for each plan and printable labels for each recipe. These beef dump recipes are easy to throw together and perfect for freezing. Freezer meals make a lovely gift for friends who are going through an illness or loss or adding to their family through birth or adoption. 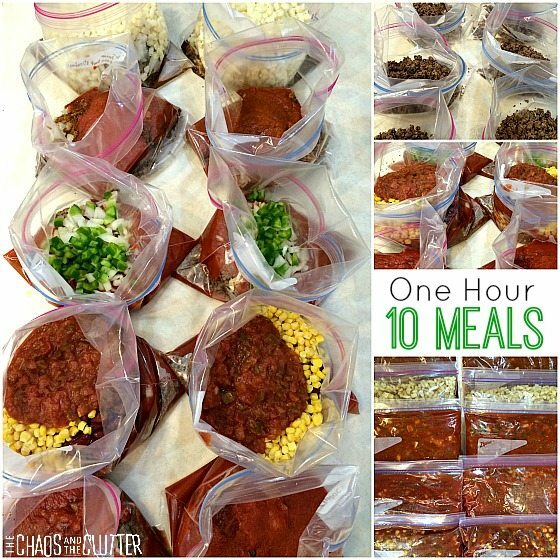 By doubling these recipes, you are able to assemble ten meals in just one hour! (note that this does not include the time to brown the beef) The key to successful beef dump meals is to have all your ingredients out before you start assembling. 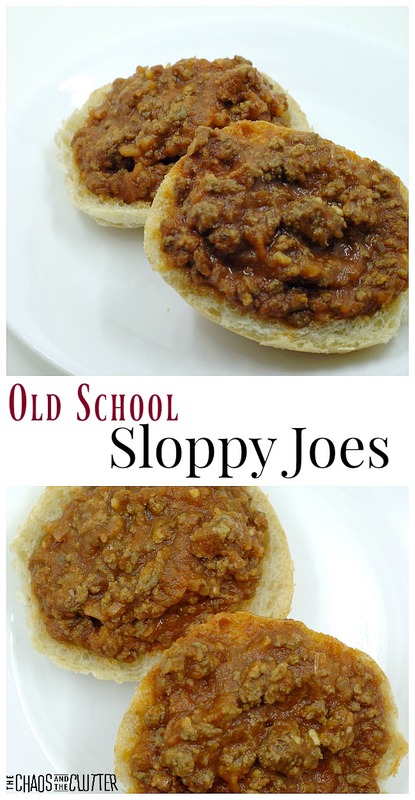 This will save you time and will also save you having to run out to the store to pick up a missing ingredient! Brown the beef. This can be done the day before and kept in the fridge until you are ready to use. You can also season with a bit of salt and pepper while browning if you like. Label resealable freezer bags (you can use a permanent marker or print labels to stick on) with the name and cooking instructions. Prop the bottom of the bags and fold over the top so that they will stay open. Add browned ground beef into each bag. 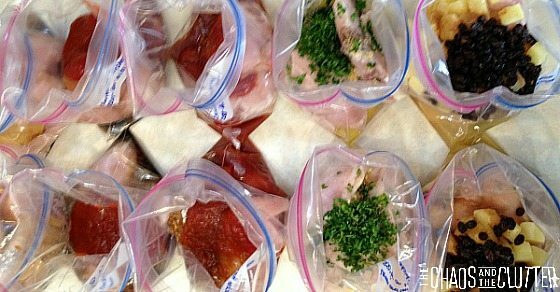 Once the meat is in all of the bags, dump the ingredients for the recipe into the bag. When all the ingredients are in each bag, remove the excess air, seal the bags, lay flat, and freeze. 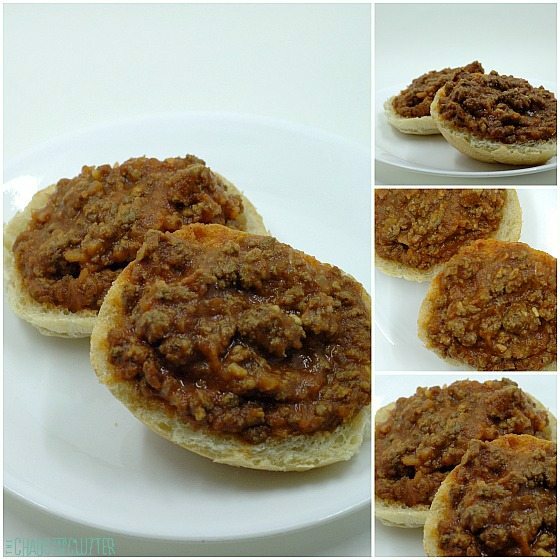 Below is a sample meal plan which uses ground beef for all of the recipes. Don’t forget to brown the beef before you start assembling. You can find the shopping list, labels and other meal plans including those using other cuts of beef in the Beef Dump Recipes book. *This amount is the equivalent of half a 1 kg bag, so if you are making two of these recipes at once, buy one large bag and split it between the two meals. **I use an MSG-free, gluten-free dry onion soup mix. Cooking instructions: Thaw. Bake at 350° for one hour, topping with grated cheese the last 10 minutes if desired or in the crock pot on low for 2-4 hours, topping with cheese the last 20 minutes if desired. *store bought taco seasoning can contain gluten, so I make my own. Cooking instructions: Thaw. Heat in large pot on stovetop on medium heat until desired temperature or cook in the crock pot on low for 3-4 hours. *Be sure to use gluten free Worcestershire sauce if wanting this to be gluten free. Cooking instructions: Thaw. 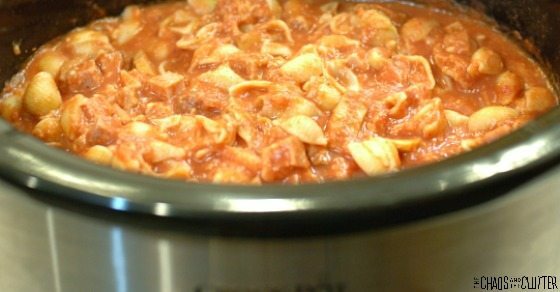 Heat in pot on stovetop over medium until desired heat is achieved or cook in slow cooker on low for 2-3 hours. Serve on bun halves. Cooking instructions: Thaw. Heat in pot on stovetop over medium until desired heat is achieved or cook in crock pot on low for 2-4 hours. Serve over pasta or gluten free noodles. If you plan the meals so that they have some common ingredients, it saves even more money. All recipes can be made gluten free by following the notes indicated. I heard from a reader who suggested using slow cooker liners. I had never heard of them, but it saves even more time because it eliminates the cleanup of the crock pot. Don’t forget to check out the Chicken Dump Recipes for even more options! To get the recipes listed here along with free printable labels and shopping list, sign up for our emails. Be sure to check out my Beef Dump Recipes book which includes 30 recipes divided into 5 plans plus one bonus recipe. Each plan comes with printable grocery lists and printable labels. Read the list of included recipes. You can also purchase both the Beef Dump Recipes and Chicken Dump Recipes together for more meal options and savings! *This amount is the equivalent of half a 1 kg bag, so if you are making two of these recipes at once, buy one large bag and split it between the two meals. 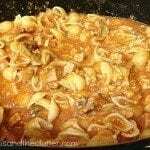 **I use an MSG-free, gluten-free dry onion soup mix. Thaw. Bake at 350° for one hour, topping with grated cheese the last 10 minutes if desired or in the crock pot on low for 2-4 hours, topping with cheese the last 20 minutes if desired. *store bought taco seasoning can contain gluten, so I make my own. Heat in large pot on stovetop on medium heat until desired temperature or cook in the crock pot on low for 3-4 hours. *Be sure to use gluten free Worcestershire sauce if wanting this to be gluten free. Thaw. Heat in pot on stovetop over medium until desired heat is achieved or cook in slow cooker on low for 2-3 hours. Serve on bun halves. Heat in pot on stovetop over medium until desired heat is achieved or cook in crock pot on low for 2-4 hours. Serve over pasta or gluten free noodles. 1 Tbsp. maple syrup this is my secret ingredient! Heat in large pot over medium until desired temperature is reached or cook in crock pot on low for 3-5 hours. Making freezer meals is always a productive use of my time, but it’s when I make chicken dump recipes that I feel the most accomplished because I am able to make so many meals in such a short period of time. I call them dump recipes because I dump all the ingredients into the bags, seal them up, freeze them, and then on the day I want to cook them, I take them out, thaw them, and then dump them into a baking dish or crock pot. They couldn’t be simpler. These time-saving recipes are just a sample of the ones found in my ebook, Chicken Dump Recipes. The last time I found myself with some spare time on my hands (with 7 kids, believe me, I rarely have extra time! ), I decided to assemble twenty chicken dump meals. I put together 10 in the morning and 10 in the afternoon by doubling five recipes each time. In my morning session, I made Chicken Hurry, Caribbean Chicken, Lemon and Garlic Chicken, Sticky Chicken, and Cantonese Chicken. Later that afternoon, I got ready to make the next ten meals by getting everything that I needed out. The key to successful chicken dump meals is having all your ingredients out before you start assembling. 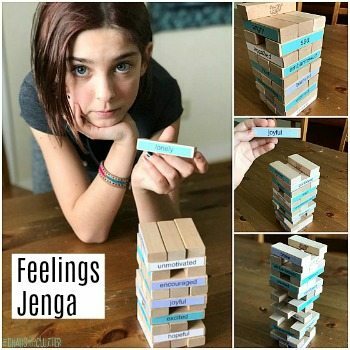 This saves time and frustration! You can also purchase Chicken Dump Recipes which includes 25 recipes, printable grocery lists and printable labels. It’s true that if you are on a sugar-free diet, these may not be the recipes for you. I want to make a difference for busy families, busy moms, busy women. I want to see people eating as a family around the kitchen table instead of eating on the run or eating fast food in a vehicle. When paired with a salad or vegetables as a side dish, these recipes (even the ones that contain sugar) are going to be healthier than eating fast food. 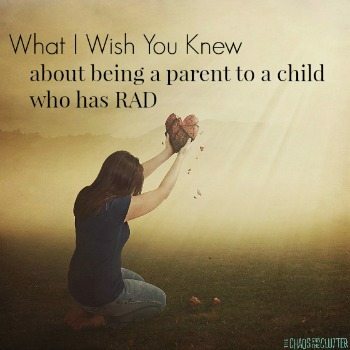 The moms who are cooking frozen pizzas or chicken nuggets and fries because it’s all that they have time for are the ones I am reaching out to with these recipes. By taking an hour on a Sunday afternoon or in an evening after the kids have gone to bed to prepare these meals, you can have healthier (note that I did not say the healthiest!) meals that your whole family can enjoy. The bulk of the work will be done already so that you can relax at the end of the day and actually have time to talk while you eat dinner together. And since I’m still a recovering people-pleaser, I am working on trying out healthier dump-style recipes. I will be publishing ground beef dump recipes and healthier dump recipes in the coming months so watch for those! Add chicken into each bag. You can use boneless, skinless thighs or breasts. 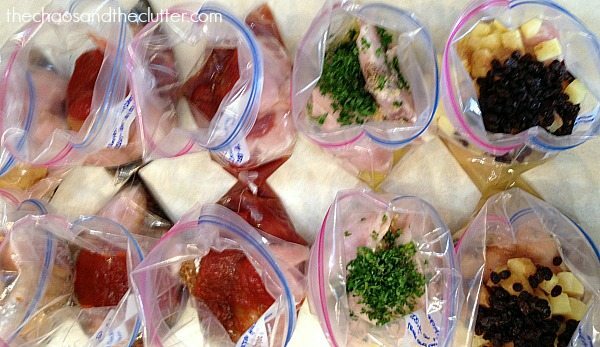 Once the chicken is in all of the bags, dump the ingredients for the recipe into the bag. Thaw. Bake at 350° for an hour or in the crock pot on low for 4-6 hours. **if you are making these gluten free, be sure to use gluten free soya sauce. Thaw. Bake at 350° for an hour, covered, uncover last ten minutes or in the crock pot on low for 4-6 hours. Thaw. Bake in the crock pot on low for 4-6 hours or bake at 350° for an hour, covered, uncovering for the last 15 minutes. **if you are making these gluten free, be sure to use gluten free soya sauce. Thaw. Bake at 350° for an hour, covered or in the crock pot on low for 4-6 hours. 3 Tbsp. dry onion soup mix* *I use an MSG-free, gluten-free dry onion soup mix. Each recipe listed is to make one bag. To make 2 bags, you will need to double both the chicken and the other ingredients. The recipes work best with 3-5 chicken breasts or 8-10 thighs per bag. If you are adding a lot more or a lot less chicken, you may need to adjust the recipes accordingly. All these recipes can be made gluten free by following the notes indicated. I heard from a reader who suggested using slow cooker liners. I had never heard of such a thing, but it sounds like a way to save even more time because it eliminates the cleanup of the crock pot. Don’t forget to check out the first 5 Chicken Dump Recipes! To get the Chicken Dump recipes listed here along with free printable shopping list and labels, sign up for our emails. Buy my Chicken Dump Recipes book which includes 25 recipes divided into 5 plans. Each plan comes with printable grocery lists and printable labels. Read the list of included recipes. You can also purchase both the Beef Dump Recipes and Chicken Dump Recipes together for more meal options and savings! Bake at 350° for an hour or in the crock pot on low for 4-6 hours. **if you are making these gluten free, be sure to use gluten free soya sauce. Bake at 350° for an hour, covered, uncover last ten minutes or in the crock pot on low for 4-6 hours. Bake in the crock pot on low for 4-6 hours or bake at 350° for an hour, covered, uncovering for the last 15 minutes. Usually when I make freezer meals, I make a variety of different things including casseroles and various meat and seafood dishes. It’s great to do it that way when I have a lot of time and have prepared. But when I just want to throw some meals together quickly and don’t want to spend hours planning and shopping for ingredients, I make chicken dump recipes. 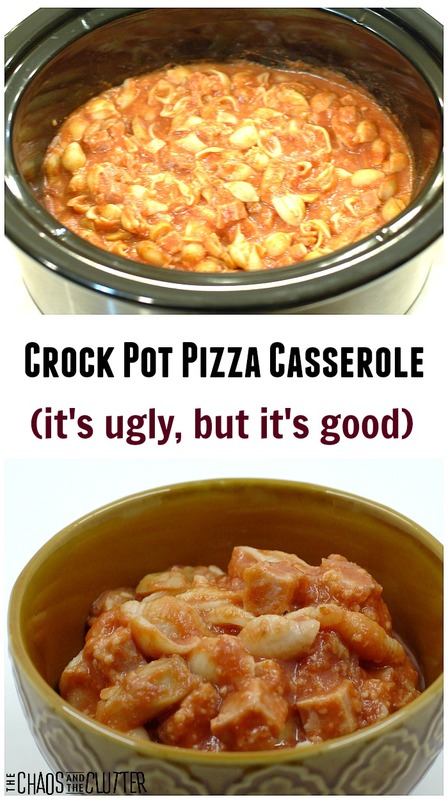 Most of them can be cooked in the crock pot, saving even more time! These time-saving recipes are just a sample of the ones I have in my ebook, Chicken Dump Recipes. Chicken dump recipes are fast to make and often, they include ingredients that I already have in the house. 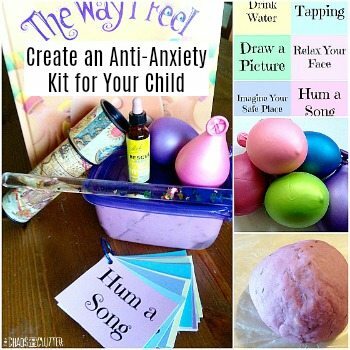 They are perfect to make if I happen to have some spare time come up. These dump dinner recipes are perfect for freezing and make a wonderful gift for someone who has just had a baby, is experiencing an illness or going through a hard time. To get the recipes in this article along with free printable labels and full shopping lists, sign up here. Last week, I had some appointments booked for Wednesday but then found out that my sitter for that day couldn’t make it so I had to cancel my appointments and found myself with sort of an extra day. I went on Tuesday and bought a lot of chicken and Wednesday made two sets of ten chicken meals. Each session took me about an hour so in just two hours, I had 20 meals made! In my morning chicken dump session, I made Chicken Hurry, Caribbean Chicken, Lemon and Garlic Chicken, Sticky Chicken, and Cantonese Chicken. I made two of each of the five recipes, so in one hour, I had ten meals. In the afternoon, I made Teriyaki Chicken, French Canadian Chicken, Cindy’s Chicken, Pepper Lime Chicken, and Lemon Mustard Chicken. It is such a feeling of accomplishment to look in your freezer and see so many meals ready for busy weeknight dinners. For all of my chicken dump recipes, printable grocery lists and printable labels, you can purchase my Chicken Dump Recipes. You can read more about it here. You asked and it is now available! 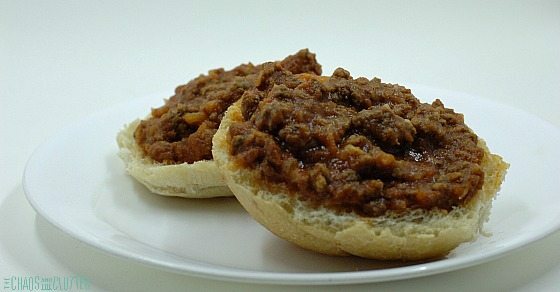 Beef Dump Recipes! You also have the option to purchase all the chicken dump recipes and beef dump recipes together at a savings! The key to successful chicken dump meals is having all your ingredients out before you start assembling. This saves time and aggravation! Thaw. Bake at 350° for an hour or in the crock pot on low for 4-6 hours. Thaw. Bake at 350° for 45-55 minutes or in the crock pot on low for 4-6 hours. Thaw. Bake at 350° for one hour or in the crock pot on low for 4-6 hours. All dump dinner recipes can be made gluten free by following the notes indicated. 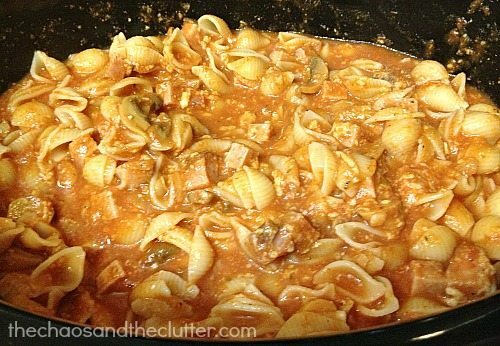 Don’t forget to check out the other chicken dump recipes for even more options! To get the recipes in this article along with free printable labels and the shopping lists, simply sign up here. Bake at 350° for 45-55 minutes or in the crock pot on low for 4-6 hours. Bake at 350° for one hour or in the crock pot on low for 4-6 hours.